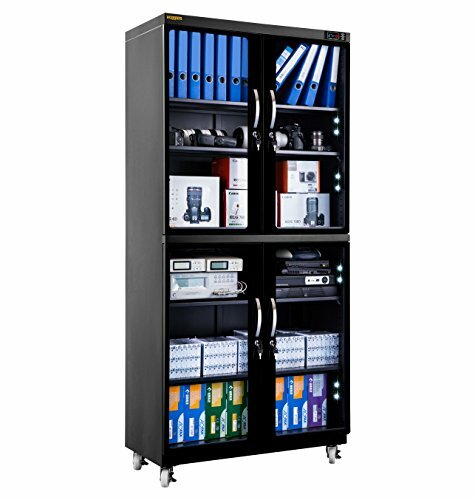 Protect your lenses, photographic and optical equipment, mobile electronics, and other valuable accessories from excessive moisture, dirt, and dust with the Ruggard 600L Electronic Dry Cabinet. The cabinet's fast-acting TE Cooling Wafer regulates the interior's relative humidity from 35-60% to help prevent fungus and corrosion that can damage your gear. Humidity adjustments take place over a 1 to 3-hour period. Fully-featured, the cabinet has a lockable, rubber-sealed glass door, with two keys, and a front metal handle. A large, dimmable LCD displays ambient temperature (in Fahrenheit or Celsius), relative humidity, and other settings. Both the base and the four adjustable steel shelves are padded to help guard against scratches.